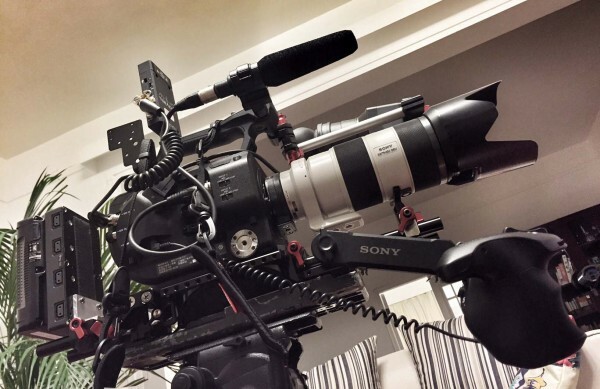 Sony FS7 field report week 1: The Canon C300 killer? I was lucky enough to purchase one of the first Sony FS7 production cameras and have been using it for just over a week. In the first of this series of reports I’m going to focus on what this camera is actually like to use in the field and the tips and tricks to turn it into a production tool. The big question for me was: Would I be happy replacing my trusty Canon C300 with this camera? The box included the camera body, grip, EVF/monitor, a BP-U60 battery, charger, mains adapter, wireless USB dongle, a small mounting plate for a Sony wireless unit, and some spare plastic covers for the various ports. 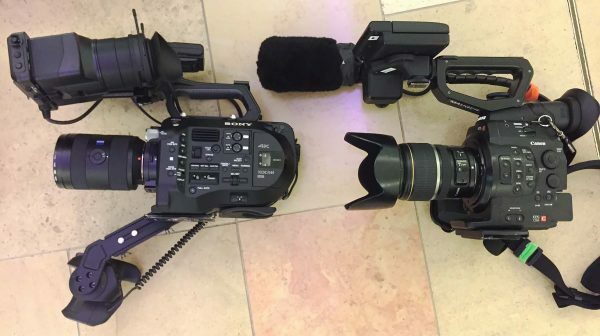 There was no mic – a surprise given that the FS100, FS700 and F3 all came with one (although the F5 and 55 do not). Oddly there was no strap either but I found a nice Manfrotto strap in a camera store that is pretty comfortable. There was no lens in my kit as the new Sony 28-135mm F4 servo zoom lens is not yet available. I’ll go more into lensing in a later post. From the moment it came out of the box it was clear to me that Sony had improved on the pre-production version I saw at IBC 2014. 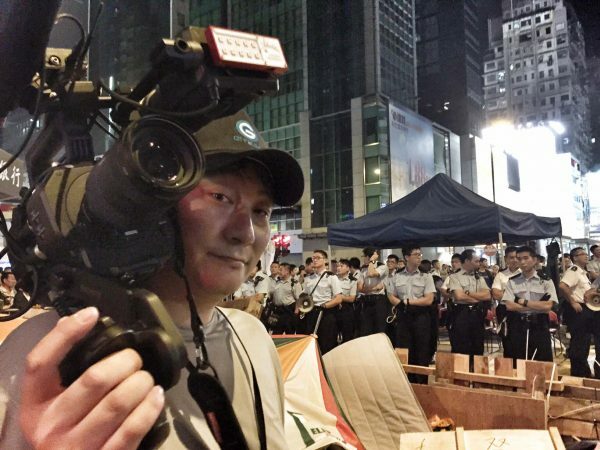 The handgrip and arm design was now much more rigid and I had no hesitation in holding the camera by the grip alone – in fact, my first assignment with the FS7 was in Hong Kong at the ongoing protests and required me to spend a lot of time with the camera held over my head by the grip alone. The body itself without all the bolt-on bits is actually quite large and substantially bigger than a Canon C100 or 300. It is made of magnesium alloy and looks to be suitably tough. If you are used to simply handholding a C100 then this camera will feel bigger instantly. If, like me, your previous camera was a C300 rigged to go onto the shoulder using a Zacuto or similar setup, then the FS7 will feel surprisingly compact and not at all heavy. Power (without the bolt-on v-lock adapter) is from Sony’s BP-U type batteries. These are the same as the EX1, PMW200 and F3 and last for a long time. 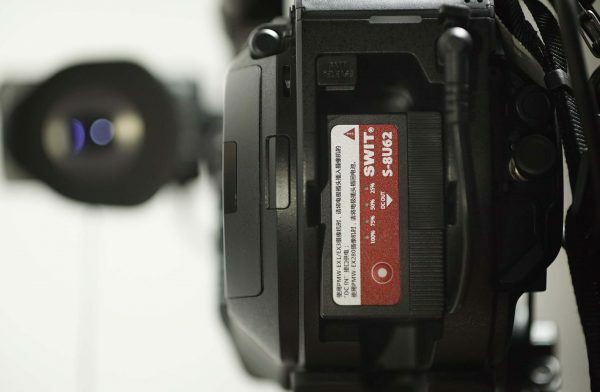 I found that the third party Swit batteries I used for my old F3 also work if you connect them via their fly power cable into the DC input of the FS7. The Swit batteries have the advantage of being able to power accessories via a d-tap port at the same time as the camera. In terms of image quality, this camera gave no surprises. So far the image has been indistinguishable from my F5. 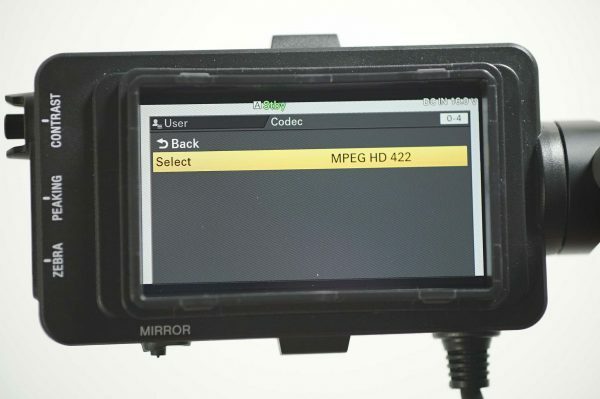 The codecs are all pretty much the same with the addition of 4K internal recording in XAVC-I. Importantly for me, MPEG-2 at 50Mbps in 4:2:2 is in there – it’s still my primary codec choice for broadcast work (the shows I work on are still all cut in FCP7 or older versions of Avid). Sadly I can’t share any of my footage from Hong Kong right now, but hopefully I can post some other vision soon. I can say that the low light performance was stunning and every bit as good as I had hoped for. I’ll leave detailed image quality testing for now. Colour and gammas are handled in a similar way to the F5. There is S-log 3 and the usual array of Sony Hypergammas at your disposal. Whether you like the ‘Sony look’ or not is a question of taste, but with a good grade the images certainly look acceptable for all of my clients. The optical low pass filter in the FS7 is likely optimised for 4K shooting and so you would expect to see some aliasing or artefacts when shooting in regular HD. Unlike the F5 and F55, this is fixed and can’t be swapped for a 2K optimised one. So far I haven’t seen anything to complain about, but this is something I’ll keep a watchful eye on. Slow motion is a key selling point of this camera and shooting up to 180fps is impressive. Again, more on this in subsequent posts, but this is one reason I bought the camera. The slow mo is not available in MPEG mode for some reason. A key feature of the F5 that is missing from the FS7 is the centre scan mode which allows you to crop an HD image just from the centre of 4K sensor. This makes it effectively a Super16 sized crop and can be used with those old S16 lenses, or as a kind of tele-convertor for S35 glass. It’s a shame not to see it on the FS7, but I guess Sony need to keep some features for the more expensive cameras or there won’t be anything to differentiate them. The layout of the camera’s controls are the best I have ever used on a large sensor camcorder. If you are coming from an ENG background then you will instantly feel at home with all the primary controls logically laid out on the operator side of the camera. There are six assignable buttons on the camera but two of those are on the handgrip. I do wish there were a couple more. 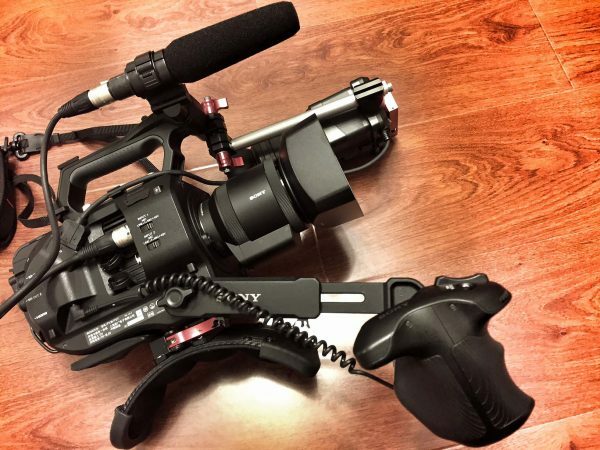 The big difference between the FS7 and other cameras is the control grip. This has a couple of customisable buttons, a zoom rocker for control of Sony’s own servo lenses, a start/stop and a jog controller for menu control. It is like a C300 grip on steroids, without having to add a Zacuto grip relocator to get it where it needs to be when shoulder mounted. Having the ability to roll the camera, magnify to check focus, zoom and engage/disengage AF all without having to take your hand off the grip is nice. The grip arms extends and the grip itself rotates. It can be folded back under the camera so the control grip can also be at the rear of the camera – great for tripod shooting. On the downside (and this is really nitpicking) to extend the grip is not screwless; you will need a flat head screwdriver or tool in your pocket. The grip is ergonomic in design and is pretty comfortable in my hand, but after a whole day shooting I did find that it had put some strain on the area between my thumb and forefinger. 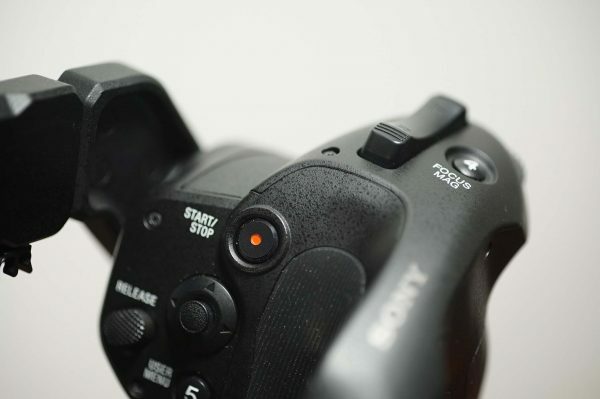 Another thing for Canon users is that the trigger button and the expanded focus button are arranged the opposite way around to the C300 and 100. The trigger is activated by the thumb and the focus expand by your index finger. This can lead to some confusion if your muscle memory is locked to the Canon way of doing things. Sadly the trigger button can’t be reassigned. One important thing to note is that if you use a sliding tripod release plate to mount your camera the grip arm blocks proper mounting at some angles. This can usually be solved by moving the arm back into line with the camera – but this slows you down and is far from ideal. 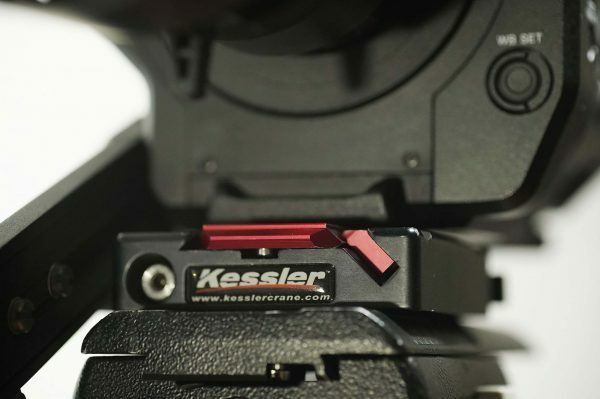 The better solution is to use a quick release system that docks from the top, like the excellent Kessler Kwik system or the Euro plates found on Sachtler’s higher end tripods. 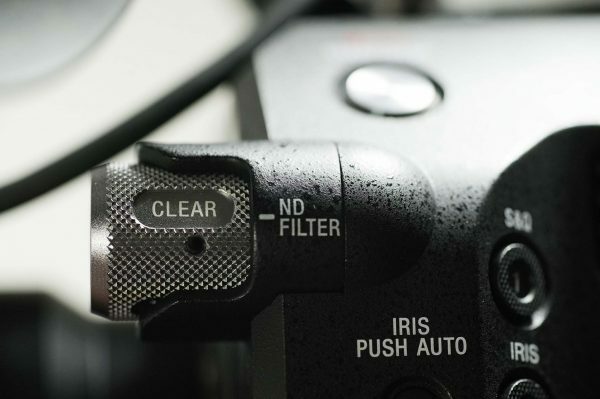 ND filters are built into the FS7. It is nice to see 1/4, 1/16 and 1/64 settings which should cope with the brightest of days. The dial itself is big and easy to adjust, but is a little gritty when turned and perhaps a little too easy to nudge out of place. Still, these are minor issues really. 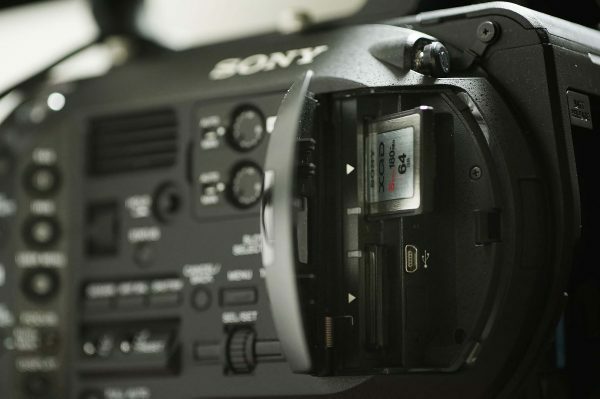 One thing the Sony engineers have got just right is the connections for the EVF, control grip and also the XLR jacks. Instead of protruding out from the camera’s side like the F5, the FS7 has them running in line with the camera body offering much greater protection from accidental knocks. This arrangement also makes it easier to put the whole setup into a bag without excess cabling sticking out. The FS7 audio controls are easy to access and better than those on the F5 and 55, which are menu driven. They are also better located than the C300 which houses them on top of the audio jackpack/screen – something I never liked. 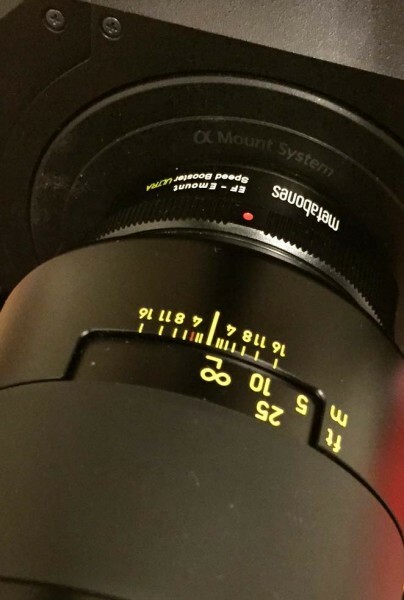 The FS7 handle has Sony’s MI shoe on top of it. This allows for mounting of accessories like the SMAD-P3 adapter for the Sony’s newest UWP-D wireless mics. With the adapter and MI shoe there are no cables between the mic and camera – something I have wanted to see for many years. Sadly, there is only one MI shoe though, so if you need two MI-connected wireless mics you are out of luck. Also on the handle are a zoom rocker and start/stop trigger, along with a mount for a 1/4 20 or an additional cold shoe (supplied in the box). 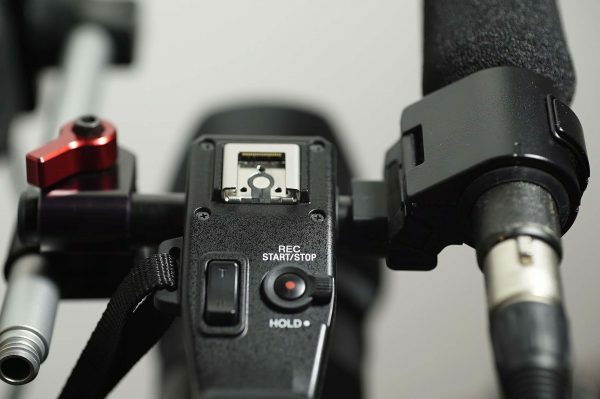 This means you can easily attach two wireless mics to the FS7. The camera menu is instantly familiar to anyone who regularly uses a Sony. It may not be the most elegant and things are not always in the most obvious place, but after a while you get used to it. One thing that has bothered me is that the camera takes a few seconds to turn on and be ready to shoot. That’s something to be aware of when shooting reality; I missed a few good moments waiting for the camera. 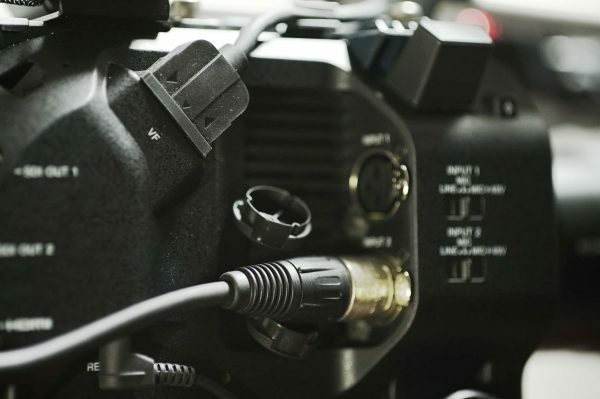 Unlike the C300 and F5 there is no info display on the camera body itself – all camera settings are only displayed through the EVF/monitor unit. This is something I miss from the F5. A major issue that needs to be addressed is the waveform monitor, vectorscope and histogram. Whatever I did on my FS7 I couldn’t get these to display on the screen, even though they are supposed to be there and are clearly shown in the manual. I assigned one of the custom buttons to activate this and treble-checked the manual to make sure I’m doing things right – but no dice. Maybe I’ve missed a crucial setting, but for the life of me I can’t find it. Assuming this is some kind of firmware glitch it needs to be addressed by Sony right away. If it is a set-up issue then Sony need to make it clearer how to turn the function on. Luckily my Hong Kong shoot was in Hypergamma and not S-Log. I was able to set up zebras and watch my exposures that way. I wouldn’t want to work with S-Log like this and I need a fix fast. The EVF is really very nice considering that it comes included with the camera. It is essentially the flip-out screen from Sony’s other camcorders but with a loupe attached which is then moved away from the camera body on a rod and cable. The loupe itself is pretty much the same as the tunnel finder Sony used on the FS100 and FS700, but slightly shorter. It is completely removable, or can be flipped up when attached, so the screen can be used as a monitor as well. This is very handy for interviews or when setting up the camera. Optical quality of the loupe is OK, but there is some barrel distortion and the build is a little creaky (mine squeaks every time you flip the loupe up). The display is similar in quality to the one on my F5 (I have the LCD one not the OLED). You can magnify the image by pressing an assignable button on the handgrip (or on the body if you set it up that way). 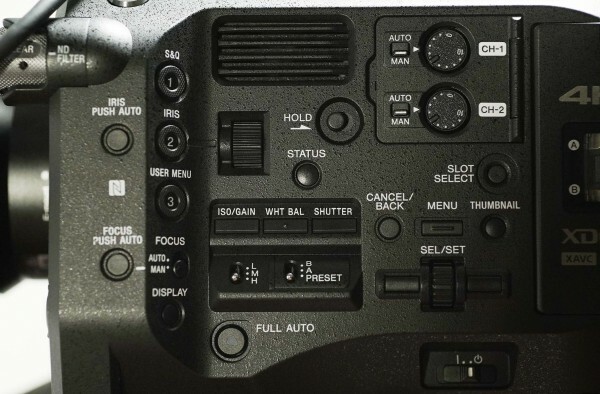 There are controls on the side of the EVF for zebra, peaking and contrast. The rod connection to the EVF is a basic affair. 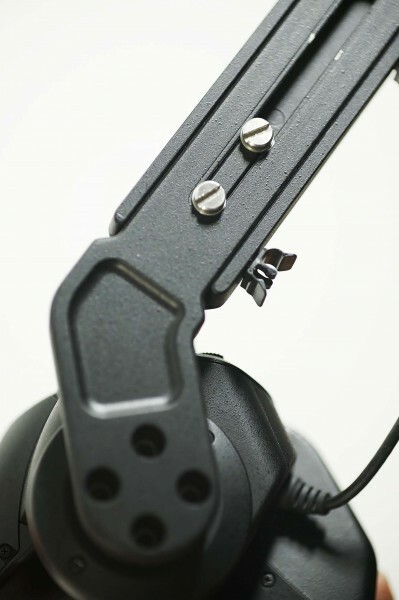 Sony have a rod/mic holder bar that runs through the front on the handgrip which in turn connects to a right angle rod clamp to another rod. This rod then runs to the EVF which has a clamp on its side. If this sounds messy then that’s because it is. The setup is clunky and the rod clamp isn’t very inspiring. Also I found the Sony rod not quite long enough to put the EVF far enough forward for my tastes. I replaced the clamp and rod with Zacuto ones after a couple of days. These are much more durable and I can now put the EVF further forward if I wish. 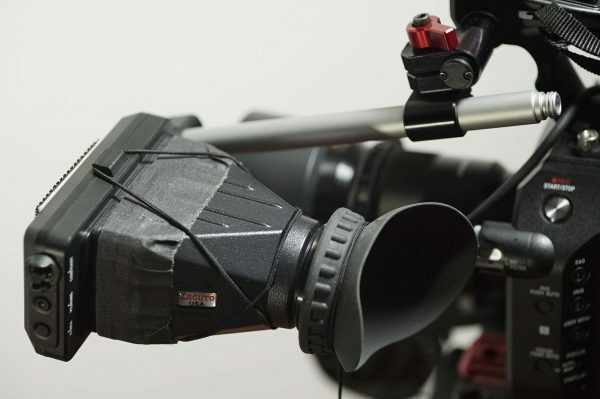 The integrated shoulder pad that sits at the rear of the camera base is a key part of the FS7 design. The pad and handgrip are designed so that you don’t need to buy any additional camera rig: the camera can function straight out of the box. This is a great idea, but sadly not so well executed. I used the camera this way in Hong Kong and found that even with a smallish stills zoom lens attached the setup was pretty front-heavy and the shoulder pad not too well padded. This might be fine for shorter shoots but after a day working my arms were sore. This balance should be improved with the addition of Sony’s optional V-lock battery/Pro Res accessory back end, which adds more weight to the rear of the camera, but if you are using the camera body as it ships, it needs some help to get to a balanced state. To fix this I have two solutions – both from Zacuto. For a light weight set-up using smaller stills lenses I added a Zacuto quick release shoulder pad attached at toward the front of the camera via a plate that also doubles as a quick release for my Kessler Kwik system. This moves the centre of gravity forward and with an average size stills zoom this balances the camera pretty well. However, it causes another issue – the Sony EVF just can’t move far enough forward because it is pretty long and bulky. 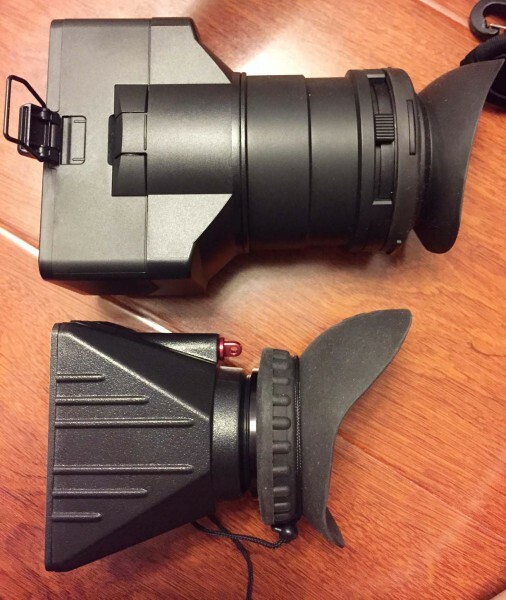 The Sony FS7 loupe (top) and much shorter Zacuto BMPCC Z-finder. The solution? I removed the Sony loupe altogether and replaced it with Zacuto’s BMPCC Z-finder. This is much shorter than the Sony and still allows me to see the whole screen. It attaches via a sticky frame and you can add elasticated hairbands to keep it in place in the event of an accidental knock if you are worried about it. I can still use the EVF as a display too, but I have to clip off the Z-finder first. The end result is a much better balanced camera with minimal extra rigging. The only thing I have to attach and detach is the shoulder pad when going from tripod to handheld. By mounting the release plate toward the front of the base I still leave the original Sony shoulder pad unobstructed should I want to use that to grab a quick hand-held shot. 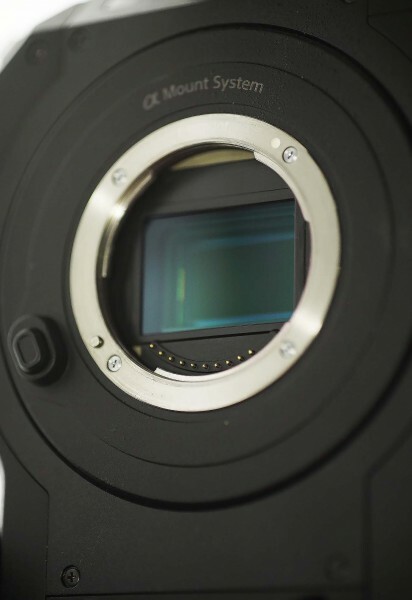 The second solution is heavier and essentially gives the FS7 a F5 like form factor. The secret to this is Zacuto’s upcoming VCT plate from their next gen Recoil system. This adds a VCT type quick release, 15mm rods front and back and a very comfortable shoulder pad. This setup is better for long lenses and heavier PL cinema glass that need support, or if you want to add a follow focus or remote. For now, in the absence of Sony’s v-lock adapter/ProRes pack you can add a battery plate and mount on the back for counterbalance. A rosette adapter needs to be added to the VCT to allow the Sony grip arm to attach, but otherwise you don’t need much else to make it work. As a firm advocate of on-the-shoulder shooting this camera fits right into my shooting style. After adding these few small Zacuto bits the controls and the ergonomics are perfect for the way that I shoot. Moving rapidly from shoulder to tripod and back again is a breeze. One advantage the Canon C100 and C300 do have over the FS7 is that they can be stripped down into much smaller packages. Being heavier and not having a screen on the body means that the FS7 won’t go easily onto a handheld Steadicam or brushless gimbal. 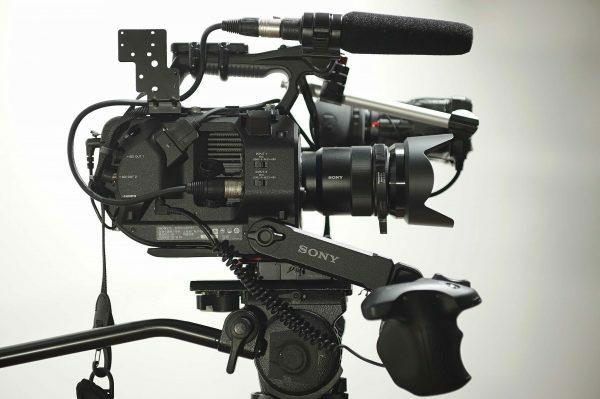 Sliders, jibs, car mounts and even tripods need to be slightly heavier duty when using an FS7. If you do a lot of camera movement this way then this is really important to consider. Luckily I have the diminutive Sony a7S (and a trusty old FS100 as well) for all those kind of moves and don’t intend on using the FS7 that way for solo shoots. Still, if you want one camera to do it all then this remains a strong card for Canon’s C series. My FS7 and Newsshooter contributor Nathan Mauger’s Canon C300 ready to go out for filming in Hong Kong. Recording is to XQD cards. First seen in Nikon’s D4 cameras these cards are still relatively expensive but boast fast write/transfer speeds and are more robust than SD types. I went for three 64GB Sony S Series XQD cards. These are fast enough for all recording modes including the top XAVC-I 4K mode. There are faster XQD cards coming out soon from Sony but I can’t see the point for the FS7 unless you really need the very fastest offload speeds to you computer. While shooting I found sometimes I would inadvertently open the card door when carrying the camera. Luckily the cards are securely spring mounted in the body and won’t fall out even if the door is open. Even so this is a design flaw and shouldn’t happen on a camera of this calibre. I’m guessing that if you add on the upcoming V-lock battery/Apple ProRes pack then this is less likely to happen but we’ll see. I’ll go into more detail on lenses in my next post, but as a word of caution I will say: Don’t rush to buy this camera expecting it to work flawlessly with the Metabones Speedbooster Ultra or EF to E-mount adapters – it doesn’t for now at least. Hopefully there may be a fix from Metabones but this isn’t a combo I recommending at the moment. If you are a Canon shooter with a horde of EF lenses then this may well be a good reason to stay with a C100 or C300 for now. There are plenty of other lens options for the FS7 though, some incredibly inexpensive, and I’ll detail those soon. So has this camera won me over from the C300? Well actually yes, so far – with the exception of the waveform/histogram issue which I assume Sony will solve. I need to test more but at this point I’m confident that it will replace the C300 (and possibly my F5 too) as a daily workhorse. Ergonomically it bests the C300 and it suits my style of shooting. It has the 4K option but, just as important for me, it has all the flavours of HD that I need including good old MPEG. Slow motion is a big deal too. I still prefer Canon colours out of the box – but the FS7 produces some nice looking images that I’m pretty happy with.